The wife of the former deputy finance minister of Russia last night won an auction at the Conservative summer party to play “the ultimate tennis match” with David Cameron and Boris Johnson. The auction took place at the Hurlingham Club, west London, where secretaries of state sat at tables sponsored by hedge fund tycoons, senior oil executives and property developers. Lubov Chernukhin, a banker, is believed to have paid £160,000 for the lot. 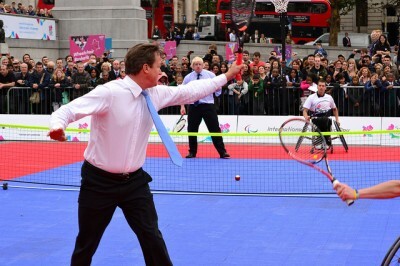 Conservative party headquarters refused to comment on the identify of the wealthy tennis challenger. The Mayor of London’s spokesman said the sale of the match was “a party matter’” and referred inquiries to party headquarters, as did Downing Street. The auction was conducted by Hugo Swire, the foreign minister and former Sotheby’s director, who volunteered Lynton Crosby, Conservative party election director, and Lord Feldman, the party’s chairman, as ball boys for the tennis match. Other auction prizes included a “Fantastic Eight Gun Pheasant Shoot”, which according to the event brochure was donated by Rosemary Said, wife of the Syrian-born business man Wafic Said. A bottle of champagne signed by Margaret Thatcher was auctioned off for £45,000. A pot of honey was sold for £20,000. Sources said the auction alone raised £500,000. Almost the entire Conservative cabinet attended the event. Among the attendees was James Henderson, the chief executive of public relations and lobbying firm Bell Pottinger, who was a member of the organising committee. There is no suggestion that any of the guests discussed policy or commercial issues with politicians. But the latest revelations by the Bureau have renewed calls for greater transparency around fundraising events. Sir Alistair Graham, former chairman of the independent Committee on Standards in Public Life, heavily criticised how political party fundraising events provides an opportunity for powerful business leaders to secure secret access to high ranking politicians. “It’s shocking that you can pay for such secret access,” he told the Bureau. Concern was echoed by Spinwatch director, Tamasin Cave. She said: “There is now a huge gulf between people’s expectation of how politics should be done, and the Conservative party’s modus operandi. “Just ahead of the last general election, nearly five years ago, David Cameron said he believed politicians should come clean about who is buying power and influence. On Tuesday, the Bureau revealed billionaires, lobbyists and foreign business tycoons with a combined wealth in excess of £11bn paid up to £12,000 a table to dine with cabinet ministers including the prime minister, home secretary and defence secretary as well as the secretaries of state for health, transport, culture and justice. Among the guests were 73 financiers, 47 retail and property executives and 12 lobbyists. Secretaries of state at the Hurlingham included George Osborne, Michael Gove, Jeremy Hunt, Eric Pickles and Sajid Javid. Business minister Michael Fallon and city minister David Gauke were also present but London mayor Boris Johnson did not attend. Guests at the fundraising event dined on smoked duck and chicken rillettes, fillet of seabass with asparagus and jersey royals and chocolate orange truffle cake. There were more than 50 tables. Each guest’s place setting included an individual ‘pledge card’. Supporters dined in a room which opened to the club’s croquet lawn beneath a dozen heavy white floral ‘chandeliers’ hanging in dense cones from the ceiling. The prime minister and his wife sat at a long table with around 40 other guests in the centre of the room.